Nick’s review of Timney Trigger left me in a Show Me state of mind. When it comes to product reviews, Mr. Leghorn is not often a five-star general. So I sent off for my very own Timney to see if their go pedal was all that it was cracked up to be. First things first. You can install this trigger. Yes you. The manufacturer’s instructions are extremely clear about what needs doing and in what order. That said, if you have never removed your handgrip, be very, very careful. There are some delicate springs and whatnot that control your safety selector. They can disappear quick, fast, and in a hurry. Two things will make your trigger replacement go easier . . . The first is a pick set. 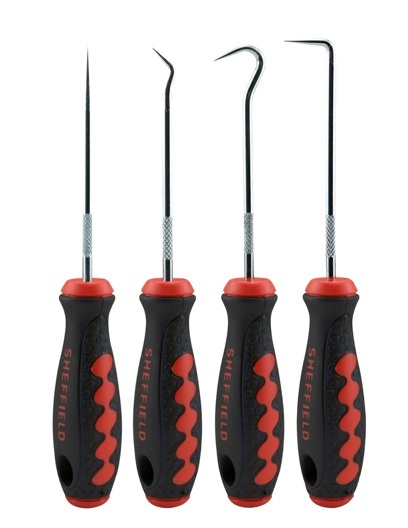 Amazon has the necessary equipment—the Sheffield Tools 5780 Hook and Pick Set—for under $10. The second is some light grease. There are some very tiny setscrews that go in place over the main tension screws. You need to move a spring to get to them with your very tiny allen wrench. The hook tool will help you move the spring without scratching your receiver or unleashing a sailor-level stream of profanity. Dab a bit of grease on the end of your allen wrench when placing and tightening the set screws. This will capture them until the threads start. Losing a small piece of metal in your receiver is bad news bears. The entire install took 20 minutes at my kitchen table. At the range, I had a very similar experience to that of Mr. Leghorn. The original trigger was such a pile of trash in comparison; I consider all rounds fired before this to be completely wasted. The Timney is crisper than a freshly picked head of Iceberg lettuce, with only the slightest (and I mean slightest) bit of creep. The break arrives cleanly at between 3-4 lbs. Nick was also right about the shape of the trigger. It really does seem to make a difference. Prior to the install, using Black Hills 55 gr. Softpoint ammo, I was able to produce the following group with my ArmaLite AR15. Tonight’s range trip delighted me with the following. For reference, those gridlines are at .25” intervals. I was absolutely giddy on the drive home. I’ve always wondered why I had a 20” barrel AR. It’s never been accurate enough to shoot past 150 or 200 yards. It’s too heavy to go try my hand at being tacticool. Now I think I really have a shooter. I’ve been debating a trip with a coworker to go take out some prarie dogs; I think the new set-up might be just the ticket. 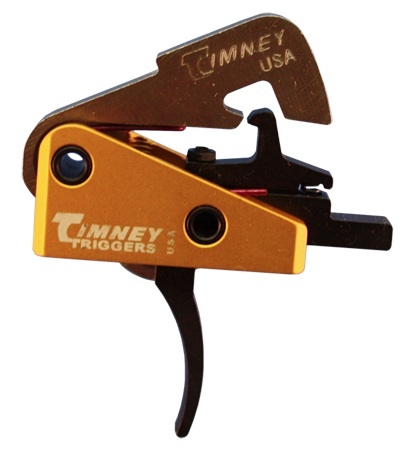 So the truth about the truth about the value and quality of Timney Triggers’ trigger is that it’s the truth. I can’t wait to take my reborn rifle out hunting this fall. Report to follow. Question of the Day: How Do You Explain Your Gun to Non-Gun Folk? A good trigger makes all the difference. I swapped the crap trigger on my .17 Savage rifle for a match grade version and found dime size holes at 50 yards. It’s amazing how much movement there is with a difficult trigger. I replaced the factory trigger on my Howa 1500 with a Timney. The original trigger was horrible. Going to a crisp clean consistent break at 2.5 lbs made a huge difference. Move the safety to halfway between the on and off positions. Drive the safety out with a punch. Now remove the hammer and trigger pins normally. The detent can be overridden when it is this position, and simply needs to be depressed down to be put back in. I put Timney triggers in both ARs I built, 16″ Carbine, and Heavy Barrel 20″ rifle. Kind of off subject, but it is about AR’s. With all of the different AR’s on the market since the ban was lifted, if you could buy one, and only one, and money WAS an object. Which AR would you buy that would not set you back so much that you couldn’t afford the ammo, or be a piece of S*&T, that no matter what ammo you put through it, it ain’t going to be reliable. Now I realize that there are a zillion between $600.00 and more than I can imagine, so what would be a middle of the road AR, that would be reliable and cost effective to own? BCM. There are two manufacturers I’ll buy DGI rifles from these days, they are Bravo Company Manufacturing and Knight’s Armament Company. BCM is a good bit less expensive than KAC. There are other good DGI manufactures like Colt and Noveske, but I don’t think Colt offers anything over BCM (except their 9mm AR) and I don’t think Noveske offers much over KAC unless you want a non-standard caliber. Another Armalite AR most likely. Or build my own. I’m also pretty interested in the M&P Sport. But, if I had it all to do again, I’d probably buy a nice AR 10. Windham Weaponry is an excellent choice that is not too high priced. I bought one of the carbon fiber models and love it. If you’re going to buy a high-end, aftermarket trigger for your AR, do yourself a favor and buy a Geissele. Not AR related but a testament to the quality of Timney across the board, my S&W i-Bolt 30-06 came from the factory with an adjustable Timney trigger and it is beyond sweet. Just the very slightest hint of slack and a break that makes me smile every time. You people cling to your religion and those evil guns. Obama is comming for you in 2012. Shoot them all you can now. In 2013 they are all gone. guns kill inocent people and animals. Say good bye to your precious guns. The people have spoken. I now own 4 more rifles than before next time get an education and deal with the problem. How’s that Obama thing working out for you now?